Bay Shore Community Congregational Church is a community church located in Belmont Shore, California. 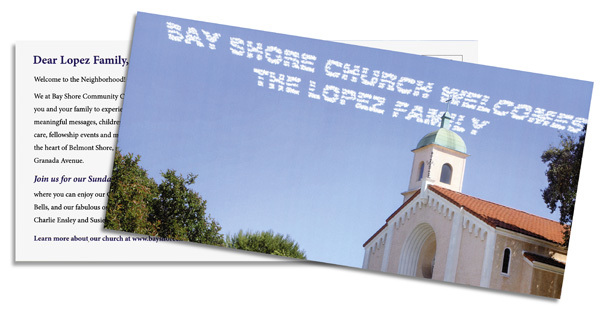 Bay Shore is a church born out of the people of Belmont Shore, with strong ties to the community, and a dedicated and active congregation. The church embraces the diversity of the local community and both members and non-members – from those who have been a part of a church most of their lives to those who are just now discovering the Christian faith. This two year marketing effort was developed to increase the number of service attendees and members of this church. Geographic area is the four zip codes that surround the church. Primary market is families which have children living in the parent’s household. Secondary market is individuals and families who are new to the neighborhood. For the primary market a variable data invitation post card featuring the family name was sent before the Easter and Christmas holidays. To the secondary market a jumbo postcard was sent to the homes of new residents whose family name is featured on the face and address side of the postcard. The concept and design of these postcards were completed by collaborating with the client inside the Castle. Castle Press prepared both the children in household and the new mover lists which were prepared through www.castlepress.com. Since the beginning, this marketing programs Sunday service attendance has increased by15%.